John Mayer, Serious Strat Player! To many people, John Mayer is simply a smooth contemporary pop artist your girlfriend listens to. Ain't necessarily so though. On a fairly recent Austin City Limits, he was doing more of an SRV thing and even brought Buddy Guy onstage for part of that show. 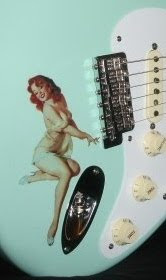 So, thanks to John Mayer, Strat tone is alive and well in pop music-- and that's a good thing. I actually think his singing voice is more similar to Stevie Ray's than his guitar style. But he's not cloning SRV like Kenny W. Whatshisname either. Mayer writes his own tunes. Mayer has recently toured with Sheryl Crow promoting his latest release, "Continuum". Following a show in Buffalo, Jeff Miers of The Buffalo News summed it up best: "...Mayer is a phenomenal guitarist, a player able to play deep pentatonic blues with conviction and chops, and a modern picker smart enough to know how to evoke a post-alternative mood. It's not likely that many of Mayer's fans head home at night to crank Stevie Ray Vaughan, Buddy Guy and Allman Brothers discs, but that is clearly where Mayer is coming from. He's a player, not a teen idol., and he has surrounded himself with the musicians to prove it. Paramount among these was the virtuoso Robbie MacIntosh, who has served tenures with the Pretenders and Paul McCartney's band, and made the most of both of them..." So when your girlfriend wants to go to a John Mayer concert, by all means GO! And have a good time. There's still hope for pop music.